The Tuesday bird walk went to the Plummer Road side of the Englishman Estuary in Parksville. The morning was cloudy but the wind was calm. 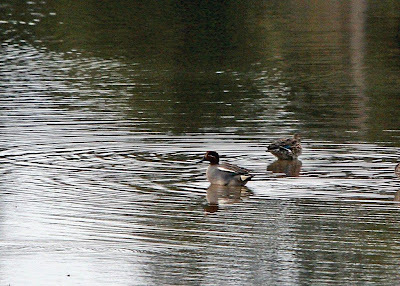 The big highlight of the morning was the sighting of a Eurasian Teal (also known as a Common Teal) in with Green-winged Teal in the San Pariel mud flats off Mariner Way. The Eurasian Teal is a Northern European duck that winters in Britain, Holland and France. 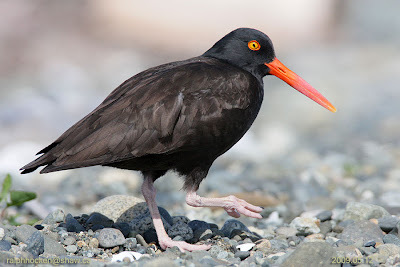 It is a regular visitor to Western Alaska and is a rare, but regular visitor along the Pacific Coast. Other highlights included seen a Merlin being chased by one fiesty Rufous Hummingbird at the start of the walk. We saw a Snow Goose and a Greater White-fronted Goose in with the Canada Geese from the viewing platform. Offshore from Mariner Way there was a mixed flock of an estimated fifty-thousand seabirds including Brant Geese, Greater Scaup, Lesser Scaup, Surf Scoters, White-winged Scoters, Black Scoters, Long-tailed Ducks, Bufflehead, Common Goldeneye, Barrow's Goldeneye, Common Mergansers, Re-breasted Mergansers, Pacific Loon, Common Loon and Pelagic Cormorants. Eurasian Teal (Common Teal) at San Pariel mud flats off Mariner Way in Parksville. Bill Pranke Photo. The Sunday bird walk went to the Shelly Road side of the Englishman River Estuary in Parksville. The morning was partly cloudy and quite windy, but the rains held off until the walk was finished. The highlights included seeing a large flock of Brant Geese. We watched two pairs of Bushtits working on building their nest. We spotted a Barred Owl perched on a tree near the end of the walk. Snow Goose, Canada Goose, Brant, American Wigeon, Mallard, Northern Pintail, White-winged Scoter, Long-tailed Duck, Surf Scoter, Greater Scaup, Bufflehead, Common Goldeneye, Hooded Merganser, Common Merganser, Common Loon, Pelagic Cormorant, Pacific Loon, Bald Eagle, Barred Owl, Northern Shrike, Killdeer, Mew Gull, California Gull, Thayer's Gull, Glaucous-winged Gull, Rufous Hummingbird, Belted Kingfisher, Downy Woodpecker, Northern Flicker, Pileated Woodpecker, Northwestern Crow, Common Raven, Chestnut-backed Chickadee, Red-breasted Nuthatch, Bewick's Wren, Winter Wren, Ruby-crowned Kinglet, Brown Creeper, Bushtit, American Robin, Varied Thrush, European Starling, Yellow-rumped Warbler, Spotted Towhee, Song Sparrow, White-crowned Sparrow, Golden-crowned Sparrow, Purple Finch, Dark-eyed Junco, House Finch, Red Crossbill and Pine Siskin. Black Scoter, White-winged Scoter, Surf Scoter, Long-tailed Ducks, Greater Scaup, Common Goldeneye, Barrow's Goldeneye, Green-winged Teal, Brant, Canada Geese, Mallards, American Wigeon, Eurasian Wigeon, Mew Gulls, Bonaparte's Gull, California Gull and Glaucous-winged Gulls were seen offshore at Shorewood Drive in Parksville. An American Kestrel was spotted perched on the hydro power lines at Ugly Dwarf Meadows at Nanoose Bay. Rufous Hummingbirds have been visiting feeders in the 3300 block of Whitetail Place in Nanaimo for several days. A Eurasian Collared Dove was seen at Black Creek. A Chukar was seen along Gary Oaks Drive in Nanoose Bay. The Tuesday bird walk went to Columbia Beach. The morning was cloudy with calm winds. 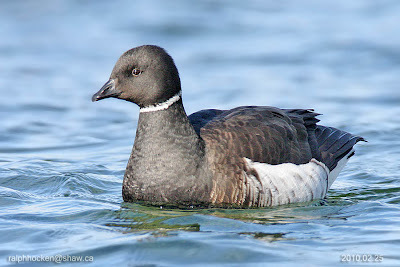 We got close looks at Brant Geese, Greater Scaup, Lesser Scaup, Surf Scoter, White-winged Scoter, Black Scoter and Long-tailed Ducks that were in four rafts of thousand upon thousand of seabirds not far from shore. Three smaller rafts of Bufflehead and Common Goldeneye were just offshore. We saw a raft of at least forty Pacific Loons, along with a Pigeon Guillemot further offshore. We saw Black-bellied Plover, Black Turnstone and Dunlin on the big rocks past the gravel bar near the Pebble Beach Townhouses. Two Killdeer and four Black Oystercatcher along with about fifty Brant Geese were resting on the gravel bar. American Robin, European Starling, Spotted Towhee, Song Sparrow, White-crowned Sparrow, House Finch and House Sparrow. A male Rufous Hummingbird is now sharing the feeder with Anna's Hummingbirds that over-wintered in the 5400 block of Altavista Drive in Nanaimo. Twenty to twenty-five Red Crossbills were feeding on Douglas Fir cones along Harlequin Crescent in Nanoose Bay. Very large rafts of Surf, White-winged and Black Scoters along with Greater Scaup were seen off Neck Point in Nanaimo. Guest Speaker: Bill Turner "The role of The Land Conservancy". Monday April 26, 2010 @ 7:30 pm. The Tuesday Bird Walk on March 30, 2010 will be going to the Plummer Road side of the Englishman River Estuary in Parksville. playground at 9 A.M. or at the corner of Plummer Road and Shorewood Drive at about 9:10 A.M. There will be NO Sunday Bird Walk on Easter Sunday, April 04, 2010. The Sunday Bird Walk will resume on April 11. Good day everyone. We have received a few reports of large rafts of scoters and scaup out at Neck Point in Nanaimo. They first arrived Monday evening but were still there Tuesday morning March 23. There is a lot of birding activity happening on the water and now is a great time to see a part of nature at its best. Swallows gave us some great views as they hawked insects. Two Ringed Turtle Doves were seen along Garner Crescent in Nanaimo. Violet-green Swallows were seen over Cathers Drive in Nanaimo. A Eurasian Collared Dove was spotted along Honeysuckle Crescent in Nanaimo. Nanaimo Lakes Road in Nanaimo. Cross Road in Nanoose Bay. Estuary in Parksville. The morning was cloudy with light showers and calm winds. Crossbill, Pine Siskin and House Sparrow. A Cassin's Vireo was heard calling at the Morrell Wildlife Sanctuary in Nanaimo. A Rufous Hummingbird was seen in the 100 block of Sandpiper Drive in Nanaimo. Guest Speaker-Colin Bartlett: The Birds and the Bees in the Backyard. Monday March 22, 2010 @ 7:30 pm. The Tuesday Bird Walk on March 23, 2010 will be going to Columbia Beach. Highway 19a at Columbia Drive, go to the tee intersection at Admiral Tryon Bld. the Englishman River Estuary in Parksville..
side of Highway 19a in Parksville at about 9: 25 A.M.
California and Mew Gulls: Ralph Hocken Photo. The Tuesday Bird Walk went to the Shelly Road side of the Englishman River Estuary in Parksville. The morning was cloudy with light showers and calm winds. 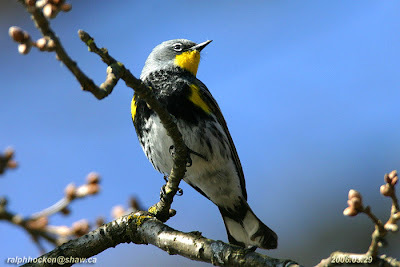 We heard and saw a Yellow-rumped Warbler. 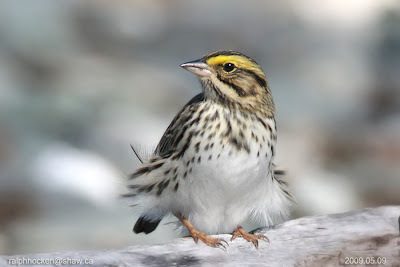 A Savannah Sparrow, the first of the season, was in with Dark-eyed Juncos, House Finch, White-crowned and Golden-crowned Sparrows that were feeding in a shrub along the trail. A Snow Goose was in with the Canada Geese along the Estuary. A raft of Common Murre and Pacific Loons were seen further offshore. There were about three hundred Brant Geese flying low, heading towards Parksville Bay. A Red-tailed Hawk was perched high up in a tall Fir Tree along the River. We had some great close looks at six Red Crossbills feeding under a big fallen snag along the Estuary near the viewing platform. 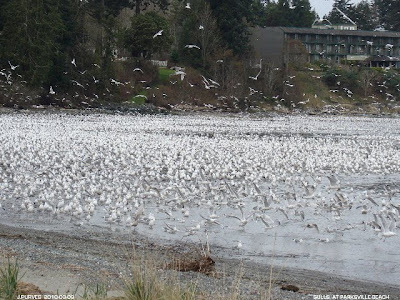 Thousands upon Thousands of Gulls at Parksville Bay in March, 2010: John Purves Photo. The morning was cloudy and the winds were bitterly cold. Yellow-rumped Warblers and Ruby-crowned Kinglets caught our attention when they were singing at different times during the morning. A raft of Buffhead, Barrow's Goldeneye, Harlequin Duck, Red-breasted Merganser and Common Merganser were in the protection of the bay at Sunset Beach. A Glaucous Gull and a pair of Pigeon Guillemots were not far from shore. Small rafts of Pacific Loon, Common Loon and Common Murre were further offshore. Canada Geese, Mallard, Double-crested Cormorant, Brandt's Cormorant, Pelagic Cormorant, Wood Duck, Buffhead, Barrow's Goldeneye, Harlequin Duck, Wood Duck, Red-breasted Merganser, Common Merganser, Bald Eagle, Mew Gulls, Thayer's Gull, Glaucous Gull, California Gull, Glaucous-winged Gull, Pacific Loon, Common Loon, Common Murre, Pigeon Guillemot, Northern Flicker, Pileated Woodpecker, Downy Woodpecker, Northwestern Crow, European Starling, American Robin, Yellow-rumped Warbler, Ruby-crowned Kinglet, Chestnut-backed Chickadee, Brown Creeper, Red-breasted Nuthatch, Winter Wren, Bewick's Wren, Spotted Towhee, Song Sparrow, Red Crossbill, Pine Siskin and Dark-eyed Junco. Twelve Evening Grosbeaks are visiting feeders along Butler Road in Parksville. A Glaucous Gull was again spotted among California Gulls, Thayer's Gulls and Glaucous-winged Gulls in the grassy area at the Community Park in Parksville. A Turkey Vulture was spotted above Sunshine Ridge in Nanaimo. Two Cackling Geese, eighteen Northern Shovelers and a Snow Goose were seen in with over seven hundred Canada Geese at Quennell Lake in Cedar. 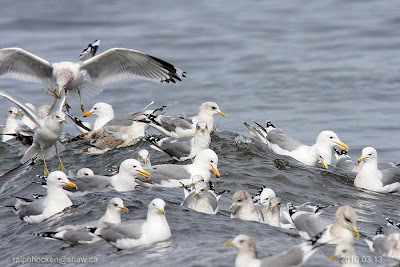 A Glaucous Gull was seen in with a large flock of California Gulls,Thayer's Gulls and Glaucous-winged Gulls along the grass area at the Community Park in Parksville. The first reported male Rufous Hummingbird of the season was spotted at feeders in the 4100 block of Gulfview Drive in Nanaimo. The Tuesday Bird Walk started in Rathtrevor Provincial Park but we were quickly convinced by the brisk winds to go to the more protected beach at Parksville Community Park. Before we left Rathtrevor we did spot twelve Trumpeter Swans. The morning was cloudy with a strong southeast wind. 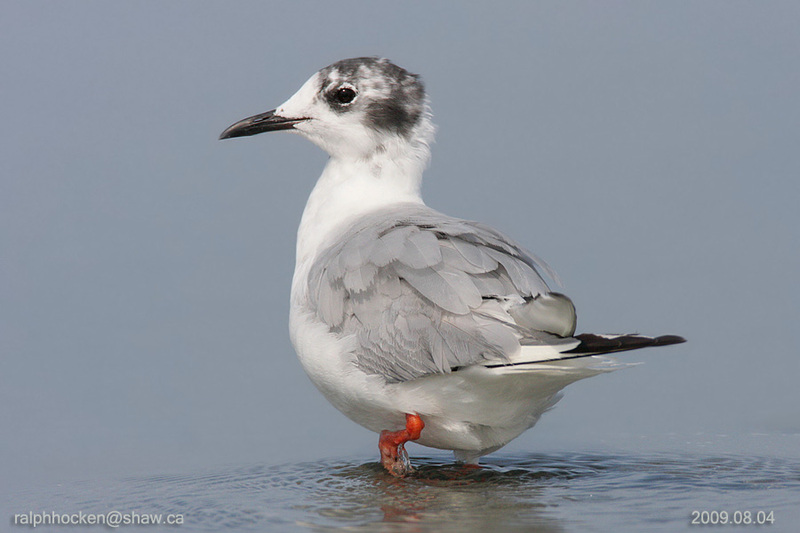 We were greeted at the Parksville Bay by an estimated one thousand Brant Geese and at least one hundred thousand gulls--Bonaparte's Gulls, Mew Gulls, California Gulls, Herring Gulls,Thayer's Gull, Western Gulls, Glaucous-winged Gulls. We had good close looks and were able to compare the yellow legs, black wingtips and short yellow bill of the Mew Gull with the deep yellow legs, black wingtips and bright yellow bill with a bright red and black marks of the larger California Gull who are in their clean crisp breeding plumage. Greater Scaup, Surf Scoter, White-winged Scoter, Bufflehead, Common Goldeneye, Barrow's Goldeneye and Red-breasted Merganser were seen further offshore. 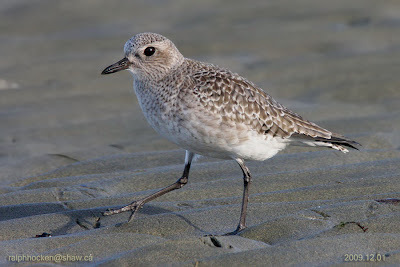 A flock of Black-bellied Plover and Dunlin left the gravel bar in a large cloud flew south down the Strait of Georgia. A Pigeon Guillemot, one Pacific Loon and one Common Loon were seen off the tip of the hovercraft landing pad at the north end of the Bay. We saw two male Yellow-rumped Warblers, one Song Sparrow and three White-crowned Sparrows on the bushes near the RV Park at the north end of the Bay. Thayer's Gull, Western Gull, Glaucous-winged Gull, Pigeon Guillemot, Northwestern Crow, American Robin, European Starling, Yellow-rumped Warbler, Song Sparrow and White-crowned Sparrow. A Turkey Vulture was seen soaring over south Nanaimo. Guest Speaker-Colin Bartlett, topic Birds and Bees in the Backyard. The Tuesday Bird Walk on March 09, 2010 will be going to the Shelly Road side of the Englishman River Estuary in Parksville. playground at 9 A.M. or at the end of Shelly Road (ocean side of highway 19a) at about 9:15 A.M. The Sunday Bird Walk on March 21, 2010, will be going to the Nanaimo River Estuary in south Nanaimo. Meet at the Birdstore at 9:00 A.M. or at the end of Raines Road at about 9: 30 A.M.
Black-bellied Plover: Ralph Hocken Photo. two male Yellow-rumped Warblers, one Song Sparrow and three White-crowned Sparrows on the bushes near the RV Park at the north end of the Bay. The Sunday bird walk went to Buttertubs March in Nanaimo. The morning was cloudy, but winds were cold. We saw our first Yellow-rumped Warblers, Violet-green Swallows and Tree Swallows of the season--- spring is near! A Wilson's Snipe flushed out over the trail as we walked by. A Northern Shrike perched across the fields from us and eventually flew over and perched on a tall snag near the trail giving us close up views. We saw both the male and female Anna's Hummingbirds. The female was gleaning insects from the branch of a tree and the male was perched close to the trail, giving us great views of his colorful gorget. A pair of colorful Wood Ducks swam slowly past us. Canada Goose, Great Blue Heron, Mallard, Pied-billed Grebe, Bufflehead, Wood Duck, Hooded Merganser, California Quail, Virginia Rail, Wilson's Snipe, Bald Eagle, Merlin, Northern Shrike, Glaucous-winged Gull, Rock Pigeon, Belted Kingfisher, Northern Flicker, Downy Woodpecker, Common Raven, Northwestern Crow, Yellow-rumped Warbler, Golden-crowned Kinglet, Ruby-crowned Kinglet, Chestnut-backed Chickadee, Bushtit, Brown Creeper, Bewick's Wren, Marsh Wren, Belted Kingfisher, Anna's Hummingbird, American Robin, Varied Thrush, European Starling, Violet-green Swallow, Tree Swallow, Red-winged Blackbird, Spotted Towhee, Song Sparrow, Fox Sparrow, Golden-crowned Sparrow, House Finch, Pine Siskin, Purple Finch, Dark-eyed Junco and House Sparrows. Western Meadowlarks, Golden-crowned Sparrows, White-crowned Sparrows, White-throated Sparrow. Fox Sparrow,Red-tailed Hawk and Red Crossbills were seen at the Nanaimo River Estuary in south Nanaimo. Twenty Trumpeter Swans were spotted flying north over the 2500 block of Glenayr Drive in Nanaimo. Anna's Hummingbird was feeding on hyacinth blooms in the same yard. Two Tree Swallows were checking Purple Martin nest boxes at Cowichan Bay. Eight California Quail were feeding in a backyard in the 2500 block of Glenayr Drive in Nanaimo. The Wednesday Bird Walk this week visited Famosa Marsh and Mission Bay in San Diego, California. Pied-billed Grebe, Horned Grebe, Eared Grebe, Western Grebe, Clark’s Grebe, Brown Pelican, Double-crested Cormorant, Great Blue Heron, Great Egret, Little Blue Heron, Snowy Egret, Brant, American Wigeon, Gadwall, Mallard, Northern Pintail, Blue-winged Teal, Cinnamon Teal, Northern Shoveler, Lesser Scaup, Bufflehead, Ruddy Duck, Red-tailed Hawk, Clapper Rail, American Coot, Black-necked Stilt, American Avocet, Killdeer, Long-billed Dowitcher, Marbled Godwit, Whimbrel, Long-billed Curlew, Greater Yellowlegs, Lesser Yellowlegs, Willet, Ruddy Turnstone, Black Turnstone, Sanderling, Western Sandpiper, Least Sandpiper, Dunlin, Heermann’s Gull, Mew Gull, Ring-billed Gull, California Gull, Western Gull, Caspian Tern, Elegant Tern, Royal Tern, Forster’s Tern, Rock Pigeon, Mourning Dove, Red-masked Parakeet, Anna’s Hummingbird, Belted Kingfisher, Black Phoebe, Horned Lark, Ruby-crowned Kinglet, Bewick’s Wren, Marsh Wren, Northern Mockingbird, Bushtit, Western Scrub-Jay, American Crow, Common Raven, European Starling, House Sparrow, House Finch, Lesser Goldfinch, Orange-crowned Warbler, Yellow-rumped Warbler, Common Yellowthroat, Song Sparrow, White-crowned Sparrow, Golden-crowned Sparrow, Brewer’s Blackbird, Great-tailed Grackle. The Tuesday Bird Walk went to the Little Qualicum River Estuary in Qualicum Beach. The water was turquoise blue with the Herring spawn. 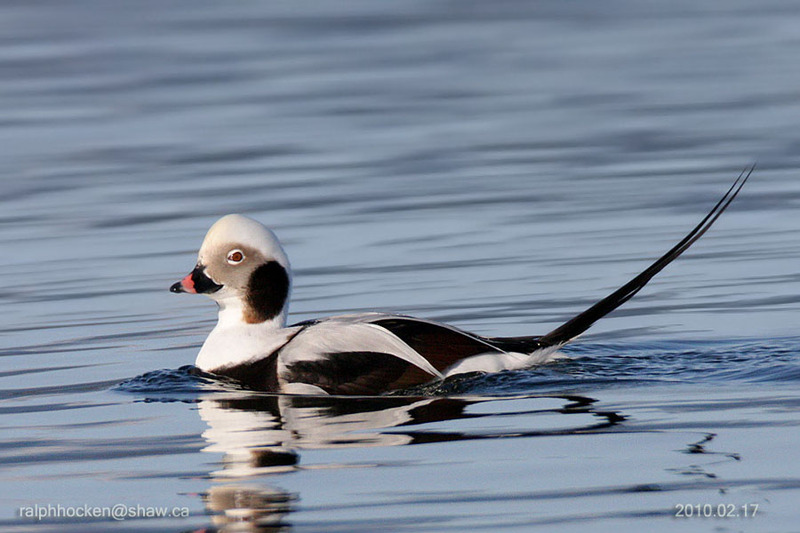 A huge raft of thousands upon thousands of seabirds, including Brant Geese, Greater Scaup, Harlequin Duck, Surf Scoter, White-winged Scoter, Black Scoter, Long-tailed Duck, Bufflehead, Common Goldeneye and Barrow's Goldeneye were offshore at the viewing platform in Qualicum Beach. Black-bellied Plovers, Black Oystercatchers, Black Turnstones and Dunlin along with Mew Gulls, California Gulls, one lone Herring Gull, Thayer's Gulls and Glaucous-winged Gulls were roosting along the shoreline. A pair of Bald Eagles appeared overhead and all the seabirds, shorebirds and gulls lifted in a spectacular display. 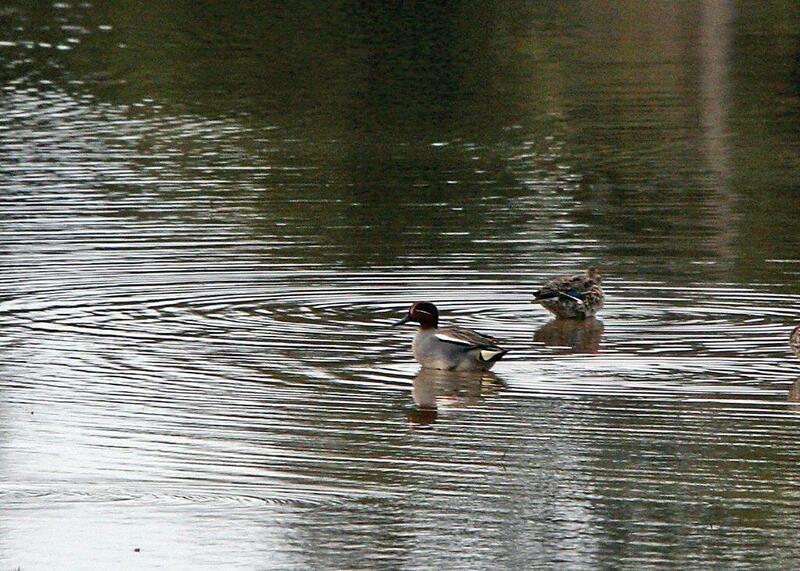 We saw an Eurasian Wigeon and a Northern Shoveler in among American Wigeon feeding along the Little Qualicum River. Twenty-one Trumpeter Swans swam lazily in the Estuary. Red-winged Blackbird, Brewer's Blackbird and Red Crossbill. Guest Speaker, Guy Monty, topic Black Brant. Guest Speaker-Colin Bartlett, topic--The Birds and Bees in the Backyard. The Tuesday Bird Walk on March 09, 2010 will be going to Rathtrevor Provincal Park in Parksville. playground at 9 A.M. or at the main parking area near the beach at Rathtrevor Park at about 9:15 A.M. Please note there is a parking fee at the park. The Sunday Bird Walk on March 14, 2010, will be going to Neck Point Park in Nanaimo. Meet at the Birdstore at 9:00 A.M. or at the parking lot off Hammond Bay Road at about 9: 20 A.M.